Five persons were arrested during a high impact anti-illegal drugs operation. A PDEA Regional Office 5 designated searcher performs markings on the seized illegal drugs inside the Tinago drug den after the search was conducted at the residence of Mallorca. A PDEA Photo. Legazpi City, [02.07.19] – [Updated] At least five suspects were arrested during the implementation search warrant authorizing the anti-illegal drugs operation at noon time today against the maintainer of a drug den in Barangay 35, Tinago, Legazpi City, a report said. 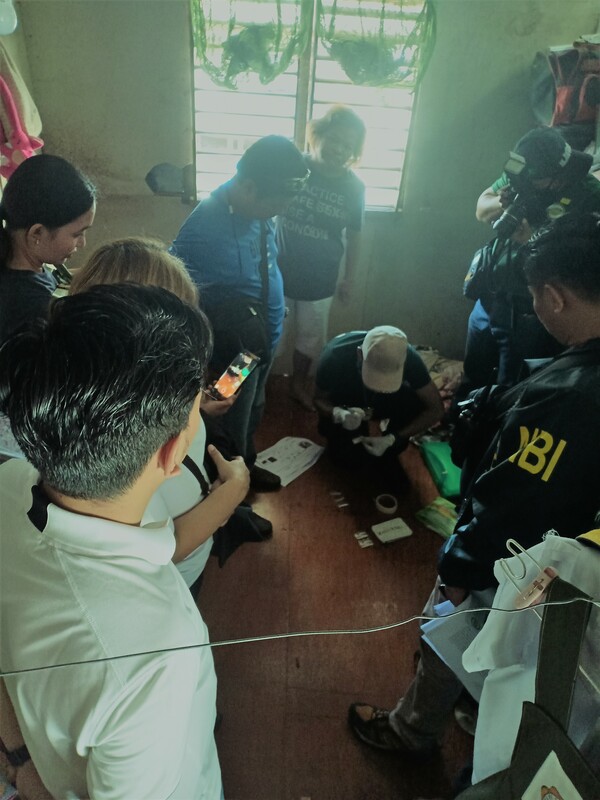 According to Ms. Cotton C. Yuson, Spokesperson of Philippine Drug Enforcement Agency Regional Office a search warrant was implemented at around 11:30 in the morning in a suspected drug den in Barangay Tinago against the suspects identified as Alona Llorca alias Madam and Louie San Juan alias Kulot. The operatives of Philippine Drug Enforcement Agency-Masbate Provincial Office led by IA I Dennis M. Benitez and Philippine Drug Enforcement Agency Regional Special Enforcement Team (PDEA RSET), NBI BRO 5 and NAVFORSOL under the overall supervision of Director II Christian O. Frivaldo, Regional Director, PDEA Regional Office V conducted a search warrant (EML-19-82) issued by Honorable Judge Elmer M. Lanuzo, Executive Judge, Regional Trial Court Branch 6, Rawis, Legazpi City. The following persons were arrested and identified in the report as Alona Llorca alias Madam, 50 years old widow, Louie San Juan aka Kulot, 32 years old who is the subject of the search warrant, while three other visitors Justine R. Dela Rosa and Angeline B. Bodopol, 44 years old and Analiza Magnaye alias Baby Ruth, 47 years old were also arrested. The high impact anti-illegal drugs operation has resulted in the dismantling of the suspected Tinago drug den and the arrests of five drug personalities, Yuson explained. The total recovered illegal drugs were estimated to be having a weight of 40 grams or with an estimated street value of PhP272,000.00. The suspects are currently under the custody of PDEA ROV Custodial Facility and are awaiting inquest proceedings as the charges for the violations of Sections 6, 7, 11 and 12 of the Republic Act 9165 otherwise known as the Comprehensive Dangerous Drugs Act of 2002 s also being prepared against the suspects.